Generate any quantity of random, strong and secure passwords with one mouse click just in seconds with Free Password Generator software. Free Password Generator application will create strong and secure passwords instead of you. With Free Password Generator you will use only strong random passwords, that can protect your identity from potential harm. Download Free Password Generator just now, and you will not have to think out new passwords, and all your passwords will be random and secure. Freeware. Free Password Generator is suitable for the professional use. You may use Free Password Generator as a portable password generator (usb password generator) on a USB flash drive. In order to use Free Password Generator as a portable password generator (usb password generator), rename file 'PasGen.exe' to 'PasGenPortable.exe'. Or download portable password generator above. Free Password Generator is a freeware product. You may distribute unlimited copies of this program in its original form to any legal place unless we notify you otherwise. Free Password Generator works under all modern versions of Windows, including Windows 10, Windows 8, Windows 8.1, Windows 7, Windows XP and others. Generating passwords 1-99 symbols in length. An ability to generate from one to 100 000 secure passwords by one mouse click. Free Password Generator can be used as admin password list generator (professional password generator). All passwords are unique within one program session (until you restart the program). An ability to exclude dubious symbols (!, 1, I, l, O, 0, o, ^, comma, dot). Including special symbols (~, !, @, #, $, %, ^, &, *, (, ), comma, dot, =, +, <, >) into a password. Composing password using only those symbols that you listed in the 'other symbols' field. Conditioning the password pronouncing by adding vowels using special algorithm. [NEW!] An ability to test passwords - checking passwords and displaying password strength and entropy. An ability to save to the text file or to copy to the clipboard one password or a password list. Can work as a portable password generator (usb password generator) on a USB flash drive. How does SecureSafe Pro Free Password Generator Work? Configure password options (as you want it to appear). Copy your password into the clipboard or generate a new one. This option includes English capital letters into the result password. A, B, C, etc. Since the generated password is random, the result may contain no capital letters even if the option is selected. This rule is applicable to all other options. This option includes English lower case characters into the result password. a, b, c, etc. This option includes digits into the result password. If this option is selected, all dubious (hardly readable) characters will be excluded. The dubious characters are: 1, I, i, 0, O, o, l, !, |, ^, double quotes, coma and dot. The length of the generated password in characters. Minimum possible value is 1, maximum is not limited. The number of passwords to generate. Minimum is 1, maximum is not limited. This option includes some special characters into the result password. As mentioned above, since the generated password is random, the result may contain no special characters even if the option is selected. If this option is enabled all characters from the edit box below the option will be included into the result password. Any - means that all characters in the password will be randomly generated. Low - guarantees one vowel sound per maximum 2 consonants. Normal - turns vowel and consonant sounds one by another. This option is perfect for remembering passwords because the generated password will be quite easy to pronounce. Both 32 and 64 bit editions Microsoft Windows 10, Windows 8.1, Windows 8, Windows 7, Windows XP, Windows Vista and Windows 2000. Under Windows 10, Windows 8 and Windows 8.1 Free Password Generator works as a desktop application. According to a recent study by Deloitte's Canadian Technology, Media & Telecommunications, approximately 90% of passwords are considered to be vulnerable to hacking. Security analysts all agree that our passwords are much more insecure than in the past. So why are hackers getting better at cracking our passwords? One of the reasons is because of a wealth of new data that they have access to. This treasure trove of data is due to massive hacks. These mega hacks have help hackers to identify the patterns that we use when creating our passwords. The other reason that hackers are finding it easier to break through password protection is because of cheap and abundant processing power. It is now possible for hackers to try out billions of password combinations in a matter of seconds. When this is combined with a huge database of passwords and improved algorithms - hacking your passwords becomes relatively straightforward for anyone with the right resources. While you are undeniably more vulnerable to password hackers than you have been in the past, this doesn't mean that there is nothing that you can do about it. Here are six steps that you can take in order to protect your passwords. 55% of people use the same password on most of the sites that they visit, according to a survey of 1805 adults by Ofcom, the UK's communication watchdog. With an upsurge in mega hacks this is leaving a lot of people vulnerable. Once hackers have access to a list of passwords used on one site, they can then use these passwords on any other site that you use as well. One of the easiest ways to protect your passwords is to not replicate them between different sites. If your password is compromised on one of the sites, it should still be protected on other sites that you use. If you think you will have trouble remembering all those passwords, see how to use password management software below. One of the reasons that our passwords have become so predictable is because the rules governing what must be contained within them tend to be similar. For example most sites require a mix of upper and lower case letters, numbers and a symbol. The way we meet these requirements tends to be equally similar. Typically when we are required to add numbers we will do so either at the start or the end of the word, and will most commonly use either the number 1 or 0. Common symbols such as !, #, @, &, * % should are also frequently employed. People often believe that their passwords are more secure than they actually are, because they deliberately use miss spellings. But unfortunately if you are using these you might not be as unpredictable as you think you are. Hackers algorithms can pick up on these common misspellings as well. If you want to protect your password then you have to do what other people don't. That means using a truly random series of numbers, characters and words. In general longer passwords are more secure than shorter ones, even if the words used on the shorter password are more complex. However when selecting a longer password with multiple words it is important that they are completely random. Using phrases or common sequences of words will be easy for the hacker's algorithms to predict. You should also keep in mind that making common substitutions such as 1 for I will not make your password safer, as these can be easily predicted by the algorithms. Appending words is also not helpful as those same algorithms will test these variations out as well. When 2 step verification on Gmail is activated, before you can access your Gmail account from a new device, you are sent a verification code to your mobile phone. Even if someone obtains your Gmail password they will not be able to access your account from a different computer. Protecting your Gmail account is very important because it is often the key that unlocks all of the other passwords you use on other sites. Never change your passwords by following links in emails that you did not request, since those links might be compromised and redirect you to the wrong place. After large hacks there is typically an uptick in the amount of phishing emails. Because users are expecting communication from the site that has been hacked, this is a good opportunity for hackers to find out your password. Do not change your password or verify it directly from any email communication. Instead enter the address of the site in the browser, and make any changes on the website itself. While taking steps to randomize your password and avoid common mistakes is a good first step, if you really want to properly protect your passwords you should use a password manager. There are a lot of popular password managers on the market and we recommend you to start with SecureSafe Pro Password Manager. Password management software is not only more secure it also makes the job of remembering passwords easier. SecureSafe Pro Password Manager uses a local decrypter installed on your computer, and the password information can be easily synced among your devices via the cloud (Dropbox, Skydrive, Google Drive or others). As well encrypting and decrypting your passwords, password management software includes password generation tools which create truly random passwords. SecureSafe Pro Password Manager can also keep regular files inside the program. SecureSafe Pro Password Manager is free to try and you can keep up to 40 passwords for free but if you want to continue to use it on your growing database you have to purchase a license for unlimited number of computers. Read more about SecureSafe Pro Password Manager here or start using it right now for free. January 13, 2017 - Free Password Generator 5.43 is released. December 09, 2016 - Online Password Generator is released. Now you can generate strong random passwords online instantly , choosing password length and other options. December 03, 2016 - Free Password Generator 5.42 is released. January 13, 2016 - Free Password Generator 5.4 is released. An issue was fixed: now Password Generator correctly displays underscores in the generated passwords. December 08, 2015 - Free Password Generator 5.3 is released. Another compatibility issue with Windows 10 was fixed: on some Windows 10 installations Password Generator occasionally was not able to copy the generated passwords to clipboard. August 29, 2015 - Free Password Generator 5.2 is released. A minor compatibility issue with Windows 10 upgraded from a previous version of Windows was fixed. Fresh installations of Windows 10 do not reproduce the issue. August 10, 2015 - Free Password Generator 5.1 is released. A compatibility issue with Windows 10 upgraded from Windows 8.1 is fixed. Previously we tested and updated Free Password Generator for clean installations of Windows 10. August 05, 2015 - Free Password Generator 5.0 is released. Free Password Generator is compatible with Windows 10. June 19, 2015 - Free Password Generator 4.0 is released. Free Password Generator now can be used as a portable password generator. In order to use Password Generator as a portable password generator, rename 'PasGen.exe' to 'PasGenPortable.exe'. April 19, 2015 - Free Password Generator 3.0 is released. An ability to show password strength metrics for every generated password is added. January 08, 2014 - Free Password Generator 2.0 is released. The password generation algorythm is improved. Now Free Password Generator generates more secure and random passwords. 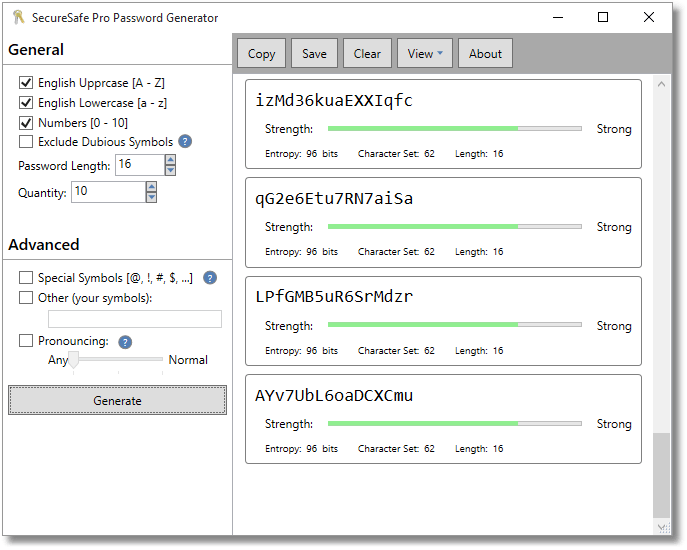 Now Free Password Generator is Windows 8.1 compatible and is updated for Windows Store. December 03, 2011 - Free Password Generator 1.5 is released. An ability to choose, how many passwords to generate, is added. Now you can generate up to 100K passwords with one mouse click! It is guaranteed, that all passwords are unique during one program session (until you restart the program). Password length increased. Now you can generate passwords up to 99 characters in length. October 08, 2004 - Free Password Generator 1.26 build 10.08 is released. An old bug is fixed: if you select "no options" and generate a password, Free Password Generator will not hang. June 15, 2003 - Free Password Generator 1.25 build 15.06 is released. Free Password Generator has it's own banner now. The installer is added, therefore the distributed size is increased up to 106 KB, but Password Generator is always available without an installer (30 KB). August 20, 2002 - Free Password Generator 1.23 is released. August 04, 2002 - Free Password Generator 1.22 is released. The feature to save options is added. Maximum passwords' length is enlarged up to 32 characters. February 04, 2002 - Free Password Generator 1.21 is released. Ability to exclude dubious symbols (1, l, O, 0 etc.). Including special symbols (@, !, #, etc.) into the password. Composing password using only symbols you listed in the 'other symbols' field. Ability to save to the text file or to copy to the clipboard one password or a password list. January 22, 2001 - Free Password Generator 1.2 is released. Ability to test your password is added. March 09, 2000 - Free Password Generator 1.1 is released (Console MS-Dos version). January 17, 2000 - Free Password Generator 1.0 is released (Win32).